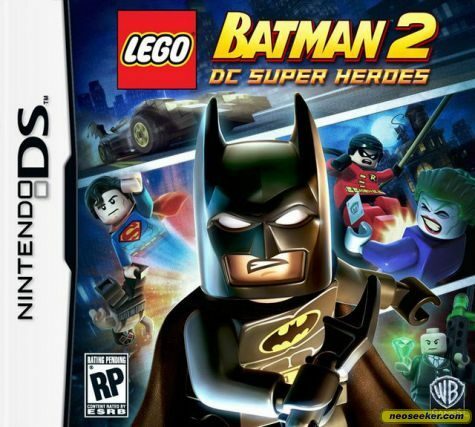 As the title suggest, this game features major DC Comics' characters. Making their LEGO debut is Superman, Green Lantern, Flash, Lex Luthor, Wonder Woman, etc. For the first time ever in a LEGO game, the characters talk. This happens only in the cinematic sequences, not during game play. A nice addition, since I do not like to read. Seriously, if I wanted to read, I would pick up a book. Speaking of sound, this game features Danny Elfman's Batman score, or at least a modified version. Game play is what you would expect from a LEGO title. There is more a sense of 'teamwork' in this title as you often need multiple characters to complete a task. One feature they added is the ability to swap your entire cast of characters while in the game. In Free Play, you have your eight characters. Often times the character you need is not in your eight. In older games, you had to chose your characters and you were stuck with them. If you needed a special ability, you would either know to select before game play...or replay the level from the beginning with the 'correct' character. I am playing this on the Nintendo DS, which is usually limited in graphics and some game play. So, any other format would even be better and worth playing. This game is definitely worth a repeat play. Last month, I was in Orlando for the DeLorean Car Show. One of the 'events' they had was the raffle. No, not the car raffle...they had that, too. Just a regular raffle for prizes. You know, things like DVD's, prints, apparel, various gift items, memorabilia, etc....oh, and car parts. Tickets were twenty dollars for forty tickets. I figured, why not? The prizes were not revealed until just before the ticket was drawn. There were some great prizes, some worth up wards of $150+, like the Shock Tower Bar. With every prize, winners were also given a Jeggs hat and stickers. I like stickers. The items were donated by various attendees and vendors, including DMC-Florida. As you know, I have at least one part on my car from every DMC vendor, except Florida. So, I really wanted to win some parts. My number was drawn and I won a DVD. Meh, not bad, basically got my $20 back. Not that is matters, but John DeLorean's grandson presented me the prize. As other items went up, I got anxious as I wanted some of the items. Another one of my numbers was called. This time Donald Fullilove, better known as Goldie Wilson, gave me my price. I like the sound of that. The item? 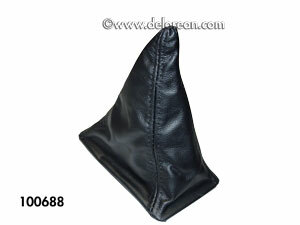 A shifter boot. Awesome! I finally got my part from DMC-Florida. The 'missing' part for my car. Did I mention that I have an automatic? This item, out of all the items that were up for raffle and nicely made, is totally useless to me. I guess I could sell it to someone at the convention. Or, I could just keep it in the car and say I have a part from each DMC vendor. Luckily, Tony Ierardi, President of DMC-Florida, said I could just exchange it. I would just need to return it and get the full value as credit for anything in his shop. I basically got the shift boot for free, now I have about $88 credit. 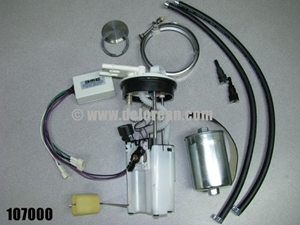 I decided to ﻿go with the new Fuel Pump/Sender Module. At $399, it was a lot to just throw down. But with the credit and a chance to get a part from DMC-Florida, I went for it. ﻿﻿﻿I sent in the shifter boot, paid the difference, and got my fuel pump. All I need to do is install it. I think I am going to take it down to DMC-Californa and let Don and Danny handle this one. Messing with the fuel tank might not be a good idea for someone who takes two hours to fix a window switch. There is a lot of safety precautions that my garage is not equipped to deal with. You know, things like a flammable substance getting all over the place. It may be a while before I take it down to Garden Grove and have this thing installed. The original unit I have is working fine, so I can wait. Plus, I have done so much to my car this year, al beit mostly minor projects. Wow, two DeLorean 'projects' in less than a week. Ever since I got my DeLorean, my Quarter Panel Louvres, or 'fake vents', needed to be touched up. While the rest of the car is in fairly good condition, especially for a thirty year old car, these louvres were faded. A few decades of direct sunlight took all the 'bright' black out. Perhaps, everything else got updated and the louvres were never touched up. So, for the past two and half years I put this off. Actually, more like six and half months. For Christmas, I got a can of SEM Trim Black (39143). Who gives someone a can of paint for a gift? Well, I kinda asked a friend to pick a can up for me and he decided just to gift it for me for the holidays. So, the can has been sitting in the garage since December. Weather and laziness kept me from painting the louvres...mostly laziness. Today was the day I finally get around to it. Argh! I forgot to take before pictures. Well, you can kinda see that my vents are a little faded in tht photo, like Pantone Gray 11...not black. First thing to do is to mask the area, I had already cleaned it. Normally, one would extract a piece before painting. But, this piece is near impossible to remove without breaking the mounts. That would leave me 'stuck' with gluing or double sticking the louvre back on. Also, you know how I am with turning five minute jobs into two hour jobs...I am not going to take off the rear quarter panels just to paint some fake vents. Once I got the area taped off, I blocked off a bigger area to avoid over spray. Junk mail actually came in handy for once. Time to get the the can of spray ready...shake, rattle, and roll...like The Honky Tonk Man. Spraying is pretty straight forward...and back, and from the sides, making sure I get everything. I sprayed two coats as recommended in the instructions. Yeah, I actually read the instructions. It goes on pretty and drys fast, waiting about five minutes between coats. I waited about thirty minutes before I removed the tape. Oh, how exciting. Finally, I have nice black louvres. I just need to wait 48 hours for the paint to cure and we are good to go. It took me longer to type this post than it did to tape up and paint the fake vents. As I have mentioned, the controls of the game are lacking compared to Years 1-4. In a way, could not really get into the game as I did with Years 1-4. Felt like I was completing the game just to complete it...and so I can complain about it here. When you create a great game like the first one, it is hard not to compare the two. I waited a while before I got these games, hoping they would combine the two, as they did with the LEGO Star Wars. Based on how different the two Potter games are, this can never happen. It seems the main focus on Years 5-7 is dueling. About 25% of the game is dueling...boring dueling. You have to dueling against about fifty characters to get your 100% game completion. How boring is it? After about five duels, you pretty much figure out how to beat anyone. Spoiler alert: All you need to do is keep blocking their shots...uh, spells...and wait for them to make a mistake. Boring! As for the rest of the game, the levels, or books and chapters, do not seem as thought out, and a lack of puzzle solving. I am wondering how the games would have played if I got them on another system. Really, the use of the stylus and microphone was simply genius. Hoping to get my hands on LEGO Batman 2. I have been having problems with my window switch. Oh, an electrical problem in a DeLorean...surprise! The switch kept sticking when I pull the window up, returns fine when I push down. I just figured it was a bad switch and worked around it all this time. Today was another hot day. I wanted to roll the windows down to let in some air. Hold on, tangent. For a long time, I thought it was 'row' the windows up/down. I thought the cranking motion on manual windows was like 'rowing' a boat. It was not until about a year ago that someone corrected me with 'roll'. Windows technically do not 'roll'. It also does not help that 'row' and 'roll' sound the same, especially in broken Asian-English. I guess future generations do not have to worry about this, since everything is push button. Where was I? Oh yeah. So, I needed some air flow to keep me from sweating up my seats. The passenger side works fine. Driver's side, not so good. Nothing was happening. Good thing, there were no toll booths, drive through windows, or ticket machines on the way home. Otherwise, I would have to open the awesome gull wing doors. Since I have put off fixing the sticking switch, this forced me to really look into the situation. I tried to get the switch out of the hole so I can check the connection and if the switch was indeed fried. The switch was stuck. After about 10-15 minutes of this, I decided to slowly take apart the center console. Yeah, I know...I am totally doing it wrong. Anyway, I got to a certain point where I had to either stop, or commit to taking out the entire center console. I have done it once to replace my bulbs with LED's...not doing that again. So, I decided to just pry the switch out. I will probably need a new one anyway, so breaking it is not an issue. Once I got the unit free, I swapped switches to check if the motor was the problem, or worse, problem with the wiring. Using the other switch, the window worked. Good, this means everything is working, and the switch might need to be replaced...again. Just for fun, I tried the 'non-working' switch...yeah, it works fine. I have no idea why it was not working, but it works fine. Good news, I do not need a new switch. I also figured out that the unit was sitting at the wrong angle, causing the switch to stick. Switches work fine...I fixed the window switches that did not really need any fixing....just a bit of repositioning. I basically spent almost two hours doing something that should have only taking five minutes. This is why I should stick to working on toy cars.